Vita Christi, in the French translation by Guillaume Lemenand, Volume II. 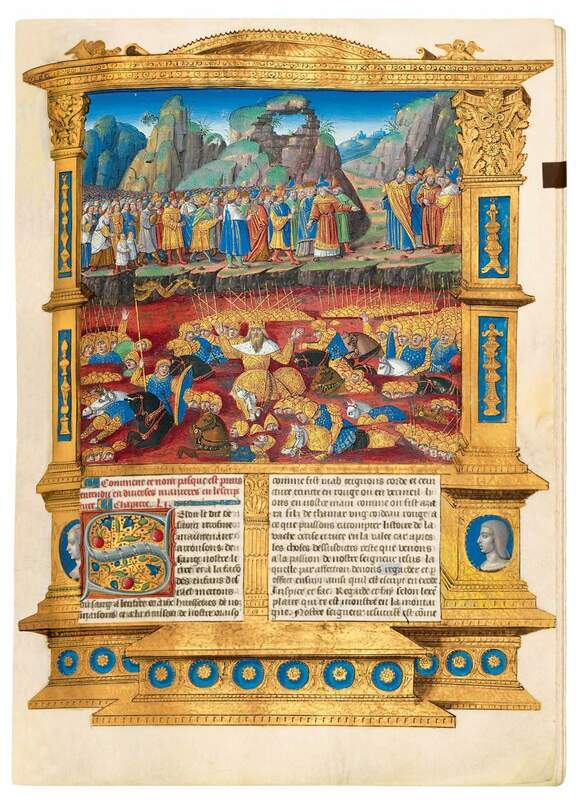 – This impressive, large format, volume with the popular 'Life of Christ' was commissioned by Philippa of Gueldres and her husband Duke René II of Lorraine. Their combined coat of arms and their portraits adorn the finest pages in the book. This text in French would have been read aloud to Philippa and her ladies in waiting, or would have served to educate young nobility at court – perhaps one of the ducal couple's twelve children. 355 x 250 mm. – 333 leaves. With 2 three-quarter-page miniatures and 81 column-wide miniatures introducing each chapter. The manuscript is adorned with an extensive cycle of fine miniatures, of which the large Christ preaching in the Temple and the Explanation of the feast of Pasqua (Passover, Moses leading his people to freedom, and the Pharaoh's army drowning in the Red Sea) are imposing examples. In his figures, the illuminator distinguishes the differing expressions of the two opposing parties by precisely directing the gaze of his figures' eyes, as expressed in the placid teacher and his unbelieving public or in Moses guiding his people away from the pharaoh, who gives chase. The absorbing red of the sea adds almost overwhelming drama to the scene. The Parisian illuminator, named Master of the Chronique Scandaleuse after his major work (Paris, BnF, Clair. ms. 481), is famous for precious codices, mainly executed for royal and noble patrons. He shows a preference for the use of strong colours, especially blue and liquid gold, in depicting drapery and architectural and scenic elements. Especially since the triumphant victory over the Duke of Burgundy in 1477, René II took control over the territories he had inherited from his mother Yolande of Anjou, Duchess of Lorraine. From 1485, René conducted a refined household with his wife Philippa, daughter of the Duke of Gueldres and Catherine of Bourbon. René and Philippa's court became the setting for artistic and literary development. Their the ducal patronage allowed artists, among whom painters and illuminators, to introduce the Renaissance into Lorraine. The volume at hand is preserved in an almost untouched condition, conveying an unblemished, fresh, and immediate impression of the artist's mastery. The long history of this manuscript's provenance until the French Revolution is known, as Philippa bequeathed her book, consisting of two volumes, to the convent to which she retired as a widow (1508). The other volume has also been preserved (Lyon, Bibliothèque Municpale, ms. 5125). See also the Epistres d'Ovide painted by the Master of the Chronique scandaleuse.